As much as I love knitting, there are certainly some elements of it I don’t like. I don’t like joining seams and I do everything I can to avoid that activity. I don’t like “weaving in loose ends” especially when you are adding new yarn, and like the seams, do as much as I can to avoid that activity. Lace knitters offer a wonderful option for weaving in the loose ends created from joining new yarn. Lace knitting is so light and open, if you were to weave in another strand of yarn, it would show and alter the thickness of the fabric. So they suggest splicing the yarn. This technique only works on fibres that will felt, so be warned. You CAN do it with superwash and nylon infused fibres, but they don’t hold as well. When the fibres are good and soaked, lay them across your palm as shown above, laying the single plies from each strand alongside the other. Then, using your other hand, rub back and forth creating heat and friction. Don’t be afraid to use a bit of pressure. 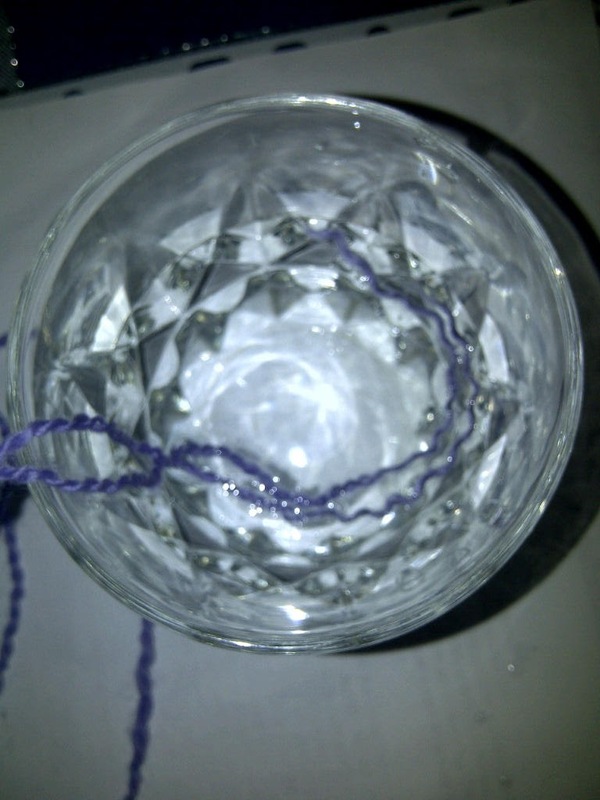 After a very short while, the single plies will fuse and you will have one complete strand of yarn. While it doesn’t look exactly like the original yarn, it is the same thickness and holds together. Once you knit it into your piece, you won’t notice it at all. Now, whenever I need to join another ball of yarn, even if it happens at the end of the row, I fuse the ends together. It is easy and most effective. I’ve even done it on the bus, soaking the ends in my mouth. And it worked. 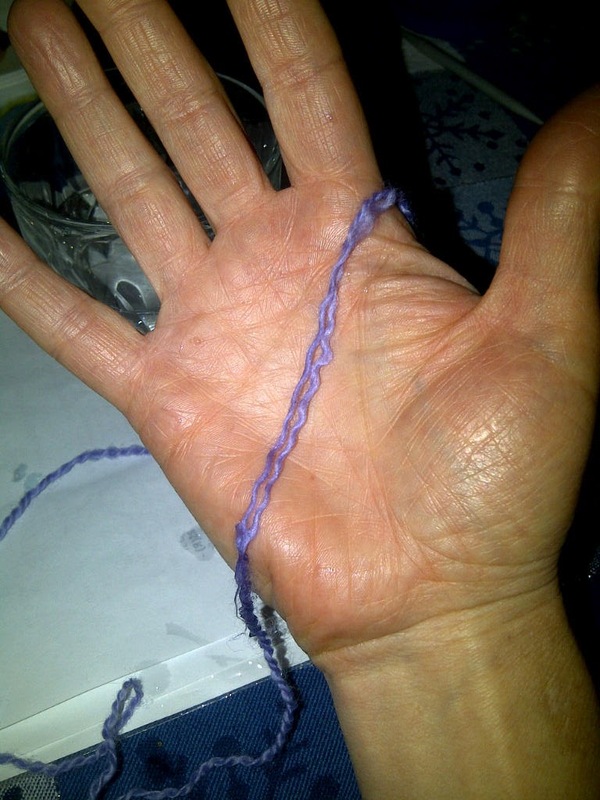 This entry was posted in knitting, splicing yarn, wool, yarn on February 19, 2012 by DianaTwiss. Workshops, planning, plying, oh my! Next Saturday I am teaching a drop spindle workshop for our guild. It’s a good deal for all involved. Back in September I received a scholarship to attend the Abby Franquemont “Spinning for a Purpose” workshop at the Taos Wool Festival in New Mexico. A condition of the scholarship is that I share the knowledge gained with the guild. I can do this a variety of ways — but I chose to repay my scholarshop by offering guild members a spinning workshop. While there are a lot of spinners in our guild, there are not a lot of members who work with a drop (or suspended) spindle. It’s a four-hour workshop designed for people who already know how to spin, but don’t know — or want to know more — about tricks and techniques that make spindle spinning functional and fun. As a result of that commitment, I’ve been unable to get my head into a new project. Believe it or not, my commuter knitting has been limited to a few rows here and there on UFO’s. The rest of my time and brain has been devoted to getting the materials prepared for the workshop. It’s no small feat. I know I could just buy all the fibre I need for the workshop and be done with it, but somewhere along my development as a fibre artist, I made a commitment to using locally sourced fibres. So, in the absence of a local fibre mill to process all the stuff, I am the processor. I’ve been drum carding and combing local dorset, montadale, romney and alpaca so folks in my workshop have a variety of fibres and preparations to experiment with. 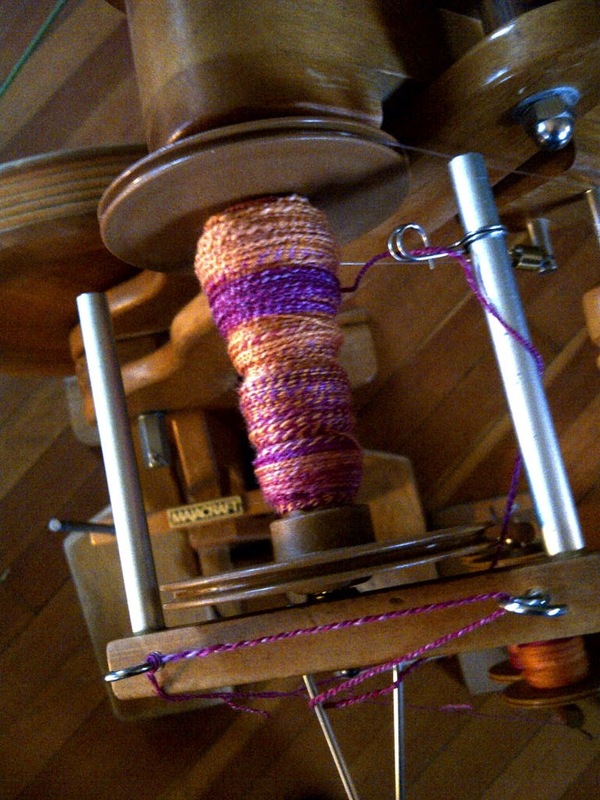 I think I am all ready for the workshop — I’ll do another run-though tomorrow — now I can relax and spin. That’s what I have here — I’m plying the “July” fibre from the Sweet Georgia Yarns fibre club. Beautiful oranges and pinks. I split the braid in two. Spun the singles very fine and am now plying them with a lot of twist. My plan is to re-ply it and make a cabled yarn. Stay tuned. There’s lots of hockey on tv tonight so I may very well get this done. This entry was posted in Abby Franquemont, cabled yarn, drop spinning, spinning, Sweet Georgia Yarns on February 19, 2012 by DianaTwiss. On Wednesday this week, I had the honour of presenting the program at the Peach Arch Weavers and Spinners (PAWS) Guild meeting. I was asked to talk about my blog; the concept of 100-mile wear; and my creative practice. Can you imagine that — being asked to talk about something you love and are passionate about to a willing audience? Doesn’t get much better than that. Envariably, as I am engaged in showing people new things it often brings to mind things that they were thinking about or puzzling over. It often happens that when I am teaching or presenting, I have the greatest chance of learning new things. And it happened at the PAWS meeting. After the presentation, the group started asking questions about fibre, spinning techniques, fibre preparation and so forth. Then, I was asked a series of questions about scouring wool. That’s the process of cleaning dirty fibre that comes right off the sheep. I told the group about my various success and failures and current practice. And then a woman told us of her experience cleaning wool. A while back, she had a filthy fibre that she tried to clean. No luck, at least not to her satisfaction. So she decided to throw the rest of it out and use it as mulch for her garden. She placed it around some plants and then left it. The fall rains came; the winter rains came, with the occasional dusting of snow; and then the spring rains came. When she went back into her garden to tidy up and get ready for planting, she noticed this wonderfully clean, good looking fibre. “I’ll take that back” she told us. And did. Time, rain, and air (who knows) cleaned that fibre. Which makes me, and the rest of us at that presentation on Wednesday wonder, what does it take to clean wool fibre enough for processing? Do we really need to use the hottest water we can make? Use Orvus Paste (sodium lauryl sulphate) — that’s pretty nasty stuff. In what ways can we simplify the process, so it works for spinning purposes, but also minimizes the impact on the environment? As one who really dislikes the process of scouring fibre, I’m keen on a process that is not only easier on the environment, but easy on me. I’m going to try putting a dirty fleece into a mesh bag and then leaving it my garden for a few months. The mesh will protect it from the leaves and twigs and such, but still allow the rains — and boy there’s plenty of that to be had around here — to wash everything clean. I’ve got just the fleece; the perfect spot in my garden, just need a mesh bag big enough to hold it all. This entry was posted in Peace Arch Weavers and Spinners Guild, scouring wool on February 12, 2012 by DianaTwiss.